This recipe isn’t going to break the internet with it’s creativity or for being something you haven’t seen before, but I frequently talk about and post about my energy bites, and when I was looking for an up to date recipe on Espresso & Cream, I realized that I didn’t have one posted! In the past I’ve made these with dates and nut butter as the binder, but truth be told we just don’t have dates on hand most of the time, so I’ve adapted the recipe to be adaptable to what I think most people typically have on hand. Though if you do have dates on hand most of the time, there are plenty of good recipes using them as well! 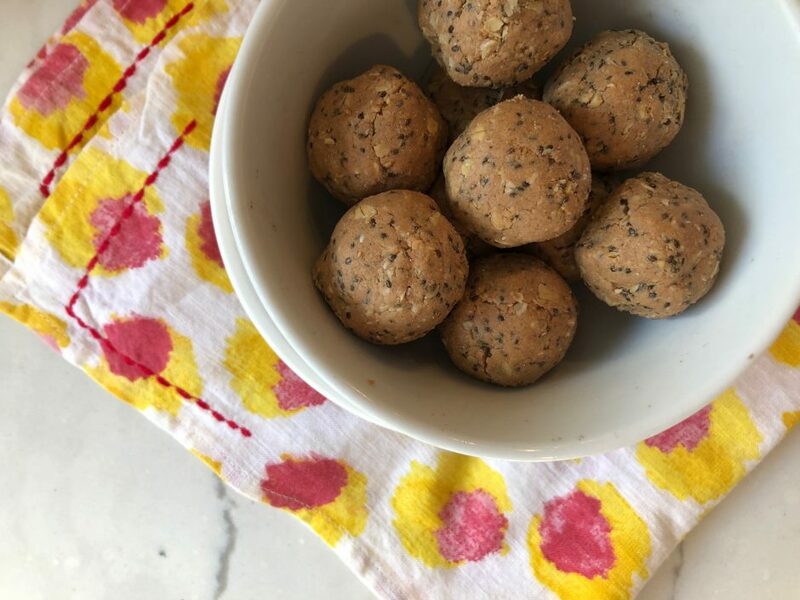 These energy bites have saved us a lot of money since I’m less tempted to grab an energy bar when I’m hungry and looking for a quick and easy snack. They are portable, and Ainsley thinks they are cookie dough that I let her eat whenever she wants so I call that a major #momwin in my book. Combine all the above ingredients together in a food processor and blend until well combined. Add additional honey or peanut butter if needed so mixture comes together easily. Scoop by heaping tablespoons and roll between your hands to form balls. Store in the refrigerator until ready to eat.